Elk Cove Mt. Richmond Pinot Noir. 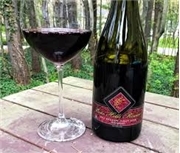 "Planted in 1996, this vineyard is moving into maturity and delivering a deep, juicy blueberry-pie flavor. It's densely fruity, with baking sprice and pie crust accents, along with a sprinkling of cinnamon powder. Absolutely delicious already, it seems best suited for near-term consumption." Elk Cove Mt. Richmond Pinot Noir.